Regardless of how you contribute, we are grateful for your support. Thanks to your donations, we provide hundreds of seniors with services. Look through the web site, stop by, or give us a call and you will start to get the picture of Center life and see why the Mason County Senior Activities Center is a wonderful place, whether you are 50 or 150. The Mason County Senior Center does so much for so many and is a one stop shop for those 50 and better and their families. ​Think of yourself, mom, dad, grandparent, friend or neighbor and what you or they might enjoy, want or need now or in the future. The Mason County Senior Center is the place where it can happen. A friendly lunch spot, fitness center, a movie with friends, a health and wellness spot, take a class, make some jewelry and the list goes on. It takes a lot of resources to run a center and we are grateful for all the donations from our center members, friends, and the community. We are a 501(c)3 agency and our contributions are tax deductible (check with your tax adviser). When goods are donated we have donation forms for tax purposes. Thank you for your help and support. The Mason County Senior Activities Center is YOU! Your unique skills and caring energy make 50 and Better the best! Reception, Host, Van Driver, Bingo & Karaoke, Flyer & Newsletter Distribution, Newsletter Prep, Class Instructors (We love learning new skills, improving old skills or having new fitness options), Data Entry and more! Come with a job you would like to do or a talent that you have and we will work with you. Volunteers with service skills are always appreciated since things break regularly. Grant Writing skills are a wonderful bonus. Those with Clerical and Secretarial talents are coveted. You don't have to be over 50 to volunteer at the Senior Center, just be willing to help. Please fill out a ﻿﻿volunteer application﻿﻿ and turn it into the reception desk or Michelle at Nifty Thrifty. Call 360.426.7374, ask for Patti Vernie or Val Wedman for volunteer opportunities at the Center. Call 360-427-0858 and speak to Michelle Marks for opportunities at Nifty Thrifty. Senior Nutrition Program﻿﻿ - Senior Services for South Sound ﻿﻿Needs volunteers with food handler cards to help with food prep & volunteer drivers for the Meals-on-Wheels program. Call Debra at 360-426-3697 for more information. We appreciate your gifts in any amount! Help us to develop the full potential of every senior in our community. Several of our members make monthly donations towards paying the principal on the mortgage for the Center, and we want to thank them very much. Even a small donation, ear marked for the principal, means a reduction in the amount of interest we must pay. Please consider making a donation towards the principal! Even a small donation, when added with others, can quickly add up to a big saving in the interest that we have to pay. ﻿Quality donations are gladly accepted at the store, during store hours only, though in some cases a free pick-up can be arranged. Please do not drop off donations any other times because they cannot be properly processed and protected from the weather. We are currently collecting cash donations to put toward new registers for Nifty Thrifty. Ours is an old hand-me-down and it is failing after all these years of loyal service. Contact any of the Staff to donate to this fund. Sponsorship is a great way for businesses to support the Center. Our Sponsors mean so very much to our Senior Center! Businesses can sponsor the many special events that are to benefit the Center throughout the year. We have raffles that Businesses can donate gift certificates, merchandise or services to every month during Bingo/Karaoke. Sponsors Donate in many special ways including: bringing in meals and treats for our Members, providing activities for our Members, buying ad space in our monthly newsletter and more! Each month the Center mails over 1000+ newsletters to it's members and distributes another 400+ in the community. 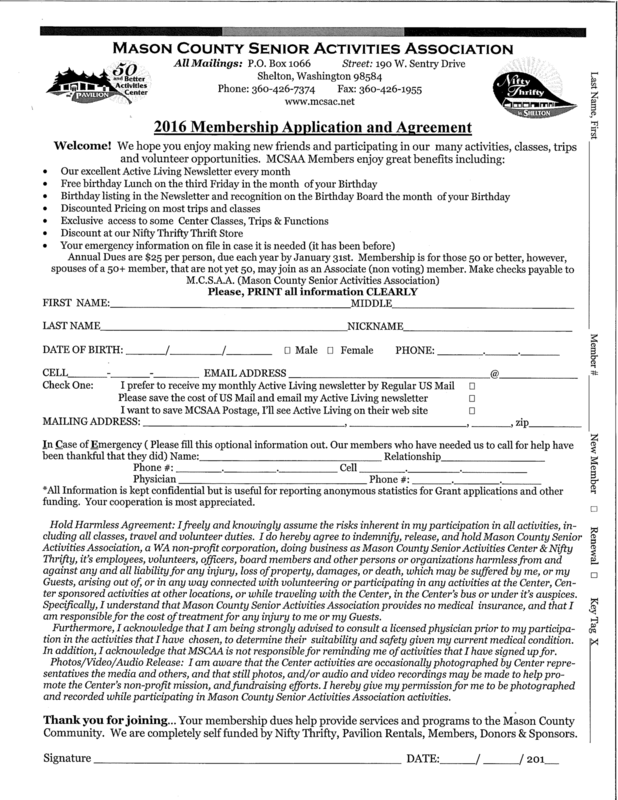 Advertising space is available to purchase in our newsletter which also gives businesses the unique opportunity to give an informational presentation to our members during the year and to display business cards or brochures on our Sponsor Table. If you are interested in becoming one of our valued Sponsors, please contact our Association Coordinator at info@mcsac.net or 360-426-7374 for more information about the benefits of becoming one of our Business Sponsors. Take advantage of your employer's matching gift program and you can double --or even triple--the value of your donation. Contact your company's Human Resources Department for assistance with gift matching (and your partner's employer may also match your gift). We all shop. Even if it is just for groceries. What would you say if I told you that your grocery shopping could earn money for the Mason County Senior Activities Center? 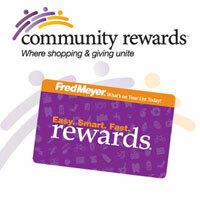 We are registered with Fred Meyer’s Community Rewards and all you have to do is link your Rewards Card with our non-profit name (Mason County Senior Activities Center) or our Fred Meyers Organization #92481 and Fred Meyers will donate money to MCSAC for every dollar you spend at Fred Meyer or QFC. This does not change or diminish the rewards that you get from Fred Meyers. You will still see your regular Rewards Points, Fuel Points & Rebates from Fred Meyers. This is a donation to MCSAA from Fred Meyers based upon your shopping. ​ Take that further and have your kids link their cards, your siblings link their cards and on…. You can all shop just as you usually would but WE earn money to help Your Senior Center grow. 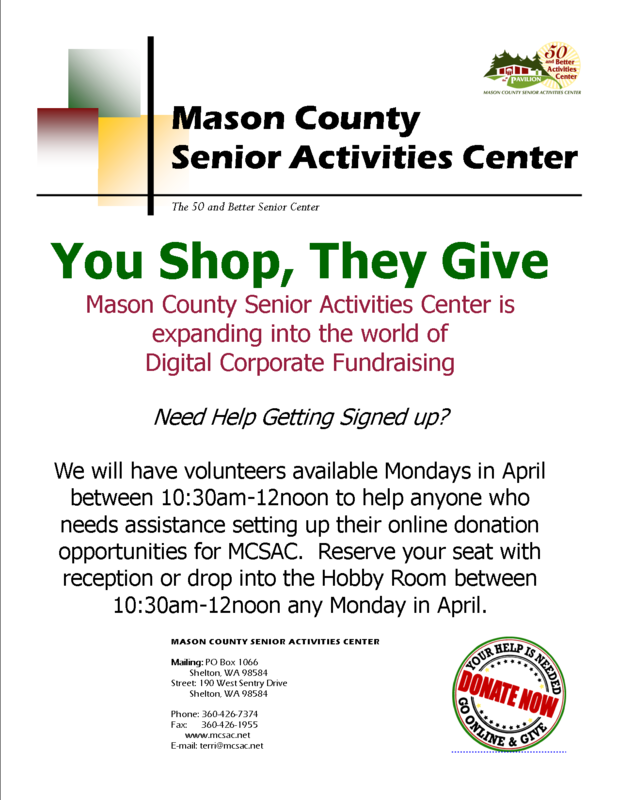 ​Turn your online Shopping & Searching into Donations for Mason County Senior Activities Center. · Just shop or search online through iGive and we earn donations! · IGive is totally free PLUS you get access to free shipping deals and exclusive coupons. · Raise a penny per search at www.IGive.com! And fill out their quick and easy form. Then start shopping! iGive has even provided a shopping assistant that you can download. It notifies you when you navigate to a website that offers donations via iGive. Give it a try today. Do you shop through Amazon? If you go to AmazonSmile and select Mason County Senior Activities Center as your charity then your purchases are supporting the Mason County Senior Activities Association because Amazon will donate a percentage of your eligible purchases to us! What an amazing way to help support your Senior Center through your regular shopping. CommonKindness coupons empower you to help your family and help others. Every time you redeem CommonKindness printable grocery coupons they provide funds to your favorite non-profit - at no cost to you! Register today to start saving money while helping others. Register store cards to earn. Register credit/debit cards to earn. Shop online or shop locally. Download their "Shopping Assistant" and earn donations for MCSAA automatically when you shop. Thousands of merchants that give back to your Senior Center. Automatically earn for your Charity. Buy things you normally buy. Shop with 1000’s of merchants who care: including ebay! Mason County Senior Activities Association will earn donations from your everyday purchases, travel and dining. Shop and sell on ebay for Mason County Senior Activities Association. Identify MCSAA as your favorite charity. Shop Listings with a blue and gold ribbon. Sell items and let your charity benefit. Shop through the eScrip link and multiply your donation! Benefit is an application that you use on your Smartphone to buy gift cards and shop at participating retailers. Buy movie tickets for AMC or Regal shows, send grand kids a gift card for their birthday and still donate to the Mason County Senior Activities Center with your purchases. Download the application from the Play Store or iTunes and let MCSAC benefit. With Benefit you purchase digital gift cards and are instantly delivered a barcode or card number for in-store mobile redemption. Instead of a typical credit card where the entire purchase price goes to the retailer, the Benefit app pushes a discounted amount to the Mason County Senior Activities Center. It might be from 3-25% of the total transaction so the contributions add up quickly. Support the things that matter most by buying books, shopping for your summer wardrobe, booking airline tickets or even indulging in a latte. The Benefit mobile app brings purpose to your fingertips, allowing MCSAC to benefit on the spot from your everyday spending. The beauty of Benefit is that you can buy what you want, when you want, instantly. It seemingly fits right into your shopping experience and can be as spontaneous as you are. We’ll track your balances and keep you posted when new retailers are added to the app. ​ So stop just paying for things and start paying with purpose! Need Help Getting Started? We have volunteers available to help you get set up on Tuesday afternoons, Wednesday mornings, and between 11:30 am-2:30 pm on Friday's. Rich & Jim are already volunteering at the Reception desk but they can help anyone who needs assistance setting up their online donation opportunities for The Senior Center. Check with Rich or Jim at the reception desk and see if they has a moment to get you started with Digital Donating! The Mason County Senior Activities Center is a place you care about and want to be there for older adults for generations to come. Leaving a Legacy Gift to the Senior Center is one way you can help this place continue to bring meaning to seniors' lives.